Things have been really busy around TerpCreek. “The Dog Days of Summer Basket Promo” is going hog wild or should I say dog wild. I’m working on a spaniel now. She is only 8 months old and so cute. Her name is Sally and she is from Kirkwood. It is not too late to get in on this promotion. For more details go to http://www.terpcreek.com/ or stop by Downtown Coffeehouse Café, Vaughn Jeweler, Jones Auto Center or Portraits by Buff and pick up a brochure and see the samples. All the samples were updated with new pets last week so go check them out. I am working on some surprise items for my Pet Promo people. They are going to love some of these items. I am also starting to work on the pet calendar and magazine article. The calendar will have to be done by November so clients can use it for Christmas presents. This year’s craft shows will features some of my new products as well and some old favorites. Christmas craft shows season will be upon us in no time. I am sent a proposal to get a big contract. I may have some exciting news for you in the next week or two. Today I want to share a fantastic recipe with you. This is the best bread pudding ever. Best yet it is a microwave recipe so it is fast. Stir in a 3 quart casserole. Let stand till bread is soaked up. Microwave on medium for 20 to 25 minutes or until a knife stuck in the center comes out clean. This is very good hot with ice cream. This is truly a comfort food. Give it a try. We had a very busy weekend. We had out of state company all weekend. We went to the Maple City Cruise at Monmouth, La Harpe Car Show and Hamilton Tractor Show. I will have photos of the cars on my website later. I have a lot of custom drawings to get done so I had better get back to work. I just put a new “Dog Days of Summer” sample basket at Vaughn Jeweler. New drawings went up at Downtown Coffeehouse Café. So stop in at both places in Monmouth, IL and take a look. Let them know you read about it on Becky’s Blog. I finished up another pet basket. This one added a framed 16” X 20”. It is on display at Downtown Coffeehouse Café till Aug. 13, 2010. 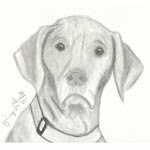 The puppy in this drawing is really cute and was a lot of fun photographing for the drawing. The Maple City Cruise Night will be in Monmouth, IL Friday, August 6, 2010, 6 p.m. to 10 p.m. It will be a great time with the car show, food and Eternity Road Band so plan to attend. The Maple City Street Machines are in charge of the show. They have been doing this show for more than 20 years and always do a great job. I delivered a new book of art to Deb and Di Restaurant in Rushville, IL. They also have two of my drawings on display that they purchased last year. If your travels take you close to Rushville stop in for a bite and check out the art. Their catfish dinner is wonderful, however my husband thinks the steaks are the way to go. All their food is fantastic!